TICKETS AVAILABLE AT THE DOOR. R300 CASH ONLY. The ensemble Profeti della Quinta has graced some of the world's most prestigious stages in Switzerland, Austria, Germany, Italy, the Netherlands, France, Belgium, Finland, England, Canada, the USA, Israel, Japan and China. Now, for the very first time, this exceptional ensemble will enchant audiences in South Africa. Profeti Della Quinta (The Prophets of the Perfect Fifth) specialise in the vocal repertoire of the 16th and early 17th centuries. The group is world-famous for its electric and enrapturing performances, vividly bringing to life the unique and rich music from the cusp of the Renaissance and the Baroque. The beauty of this sublime music transcends time, culture and place. Salomone Rossi (1570 - 1630), a contemporary of the great Claudio Monteverdi, was a court composer at the turn of the 17th century in Mantua. In addition to pioneering forms like the accompanied madrigal and the trio sonata, he was the first composer to ever write choral music for synagogue. Dr. Elam Rotem is the founder and director of Profeti Della Quinta. He has also composed a number of pieces in the style of the early baroque. All tickets at the door: R300, cash only, striclty subject to availability. Gentlemen will be required to cover their heads. "graciously sophisticated yet subtly mischievous. "; "exquisite intonation and refinement. "; "the music and the singing of it were indescribably beautiful." "Making their U.S. debut, Profeti della Quinta were as captivating in person as they had been on screen. The printed programs included text-and-translation, but it was hardly needed. They conveyed the meaning of the poetry with their diction, intention, and phrasing, commanding constant attention with their passionate and emotional music-making." "Profeti della Quinta's stunning authentic performance practice and quality of execution was truly magnificent"
"with the singers’ vivid vocalizing, it was just the kind of effort that frees this ancient music from the museum and dances it out into the town square"
"What a concert! …. From the very first notes, the excellent sound quality of Profeti della Quinta strikes the listener. It has, as is the case with the best groups specializing in the Madrigal Repertoire, a true ensemble sound. The voices unite in intervals of stunning accuracy based on firm intonation, and one hears that every detail is carefully attended to. There is a perfect balance of the voices, one is able follow each part, and the clarity of the counterpoint is impeccable. The details in every line – melismas, articulation, ornaments – are carefully carved, and the whole is clearly articulated. The Ensemble shines in quick changes from one affect to the other: from noble contemplation to jubilation to held-back pain... Profeti della Quinta are like a refined crystal glass – we hope to drink from it often." 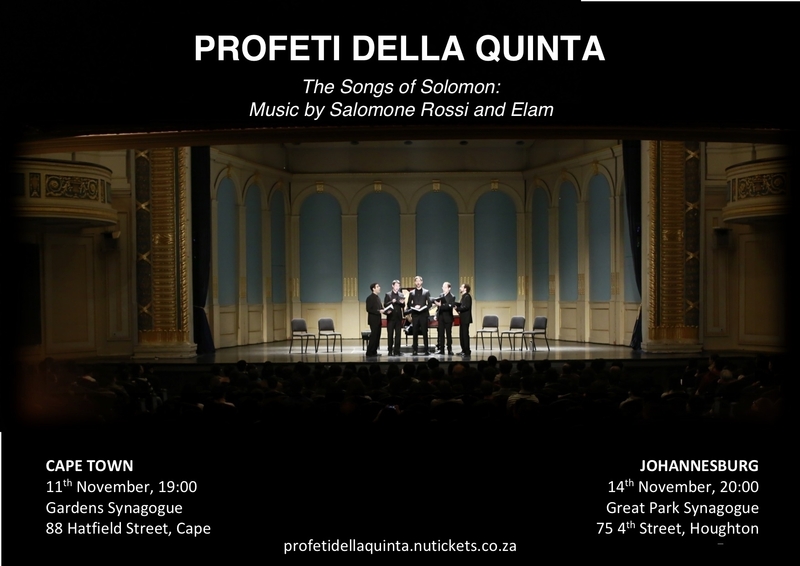 "The Profeti della Quinta singers perform with informed- and polished assurance as an ensemble and as soloists. Theirs is artistry at its finest." Doors will be closed at the start of performance. Audience will not be permi... [+] more Doors will be closed at the start of performance. Audience will not be permitted to enter during the performance. Tickets at the door are R300, cash only and strictly subject to availability.